A feast of musical events. 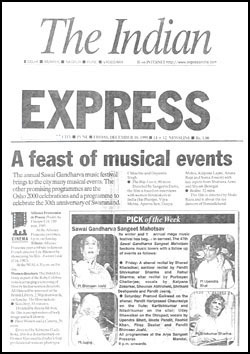 The annual Sawai Gandharva music festival bought the city many musical events.This event featured a shenal recital by Sharad Khaladkar;santoor recital by Pandit Shivkumar Sharma and Rahul Sharma;sitar recital by Purbayan Chatterjee;vocals by Kalpana Zorkarkar,Shounak Abhisheki,Srikant Despande Pandit Jasraj Upendra Bhatt,Meeta Pandit,Rashid Khan,Firoz Dastur and Pandit Bhimsen Joshi;Pramod Gaikwad on the shenai;Pandit Hariprasad Chaurasiya on the flute;Kartickkumar and Niladrikumar on the sitar and Uday Bhawalkar on the Dhrupad. Having learnt music from doyens like Narayan Pai,Madhav Gudi,and now Pandit Bhimsen Joshi,he specialises in Santwani,Thumri and Khayal.On this concert he decided to sing Raaga Yaman.The vilambit ektaal had the words-kahe sakhi kaisa kahiye and drut teental with Aa ri aa ree.He went on to engross the audience with a mishrakhamaj thumri,followed by an abhang.He was truely magnificent with his deep,resonating voice which belied his slight frame.He was accompanied on th tabla by Bharat Kamat and the harmonium by Sudhir Nair. All the legends had their part for this musical festival.The musical marathon,came to an end with the much-awaited vocal of Pandit Bhimsen Joshi.In his customary style and techniques,he gave a recital to a standing ovation,bringing an end to another successful year of this festival. 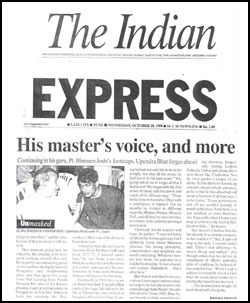 The Indian Express Wednesday,October 28,1998. Continuing in his Guru,Pt.Bhimsen Joshi's footsteps,Upendra Bhat forges ahead. Gratitude for his teacher writ large,he gushes,"I may not know all about the Kirana Gharana,but I definitely know about Bhimsen Gharana.His strong principles,concentration and simplicity are worth emulating.Whatever people may think,his patience as a teacher is amazing.A man of quiet and serious disposition - that's what he is." But Bhat is not blind in his veneration.Listening to various classical singers,he also learnt some unusual raags from Pandit Jitendra Abhshekhi.From 1985,Bhat began his solo recitals,annually touring Amritsar,Benares;also visiting London,Bahrain,Dubai and giving television shows like Chaitraban.Now he even guides a couple of students.Yet his knowlege remains unquenched;convinced as he is that he has absorbed only about a fraction of all that there is to be learnt. "Every performance sets off yet another journey towards perfection.Somehow,Iam not satisfied,at times frustrated too.Especially when I learn a new raag,it reinforces the feeling that I know so little..."he muses. ....The destination is in sight,the road ahead still a long one. In tune with a legendary singer. He has been learning Hindustani classical music under the tutelage of the legendary Pandit Bhimsen Joshi.,Upendra Bhat had to work very hard before getting the privilage of becoming Pandit Joshi's student.While he is an accomplished singer of the Kirana Gharana,Upendra also sings in sargam,tarana and other styles.He also interacts with his audience,and if they want him to present a thumri,abhang or even a light song,he responds. Upendra Bhat sings in five languages:Konkani,his mother tongue,Kannada,Marathi,Hindi and Gujarati.He can also sing Telugu and Malayalam songs. 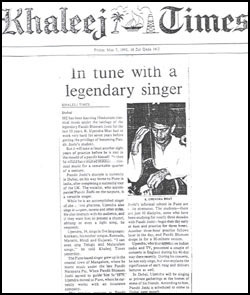 The Pune-based singer grew up in the coastal town of Mangalore,where he learnt music under the late Pandit Narayana Pai.When Pandit Bhimsen Joshi agreed to guide him in 1979,Upendra Bhat moved to Pune.Upendra Bhat also appears on Indian radio and TV.During his concerts ,he not only sings,but also explains the significance of each raag and delivers lectures as well.